I so very much enjoyed re-reading and posting about The Awakened Heart that I decided, again, to re-read and blog my thoughts around another of my favorite books. 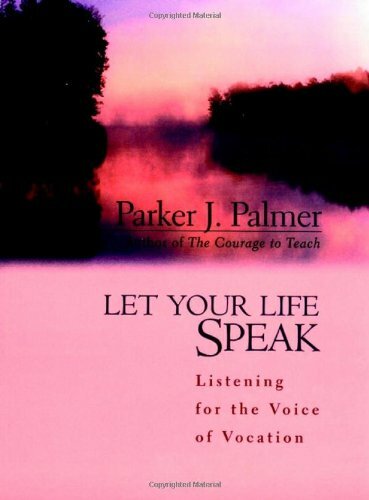 Let your Life Speak, by the renowned Quaker author Parker Palmer, was given to me by my mom in 2002. She saw it on a bookshelf and "knew" it was for me. Little did I know how accurate was her gut instinct. 2002 was, by far, one of the worst years of my life. Things were turned asunder for me - I felt deflated, defeated, and at a complete loss, wondering who I was and who God was and who my friends were. Somedays I would just sit in the dark - unable to turn on a light - my soul was so devastated. This book was a part of re-igniting the spark within me that had been covered up deeply by crappy church politics. This book helped germinate the early seeds of what is now known as reFresh. Let Your Life Speak - it's a small, short book - only 117 pages including the credits. But, less is more here. Parker Palmer's vulnerability and wisdom and invitations are profound and life-changing. This is definitely one of my top 5 books....and for a bibliophile...that's saying something! Is the life you're living the same life that wants to live in you? [In my 30s] by all appearances, things were going well, but the soul does not put much stock in appearances. Seeking a path more purposeful than accumulating wealth, holding power, winning at competition , or securing a career, I had started to understand that it is indeed possible to live a life other than one's own (2). Do you sometimes feel that way? Lay awake looking at the ceiling or have a gnawing feeling in your core that something's "not right" or "off-kilter" or not really you? Disturbed by this in himself and longing for something more, Palmer found that he began trying to "refine" his life to values and beliefs that others proposed as important. Overtime, this just made him willfully trying to craft a life and career that looked good to others, but felt dis-integrated with who he really was. Before you tell your life what you intend to do with it, listen for what it intends to do with you. Before you tell your life what truths and values you have decided to live up to, let your life tell you what truths you embody, what values you represent" (3). Palmer says that we have to re-learn this way of listening to our lives/souls/bodies because from the moment we are first taught to "learn" we are "taught to listen to everything and everyone but ourselves" and "to take all our clues about living from the people and powers around us" (5). I know that as I interact with people - this is one of the greatest struggles. People who have learned not to say what they think or what they want/need; or people who behave a certain way that is harmful for themselves so as not to disappoint the other. In the safety of a quiet, compassionate and gentle space, we lean into the places that feel "unfree" to see how that part has been wounded and longs to be set free. I have the privilege of helping people pay attention and listen deeply to their own hearts, their own instinct, their own voices, their own bodies. I get to watch people come alive as they say what they've never been allowed to say, do what they've never been allowed to do, think what they've never been allowed to think. All in the presence of the One who created the life and is wooing this life to "speak." When you hear the phrase, "Let your Life Speak" - what is your first response? Does it intrigue you or frighten you? What is your life (your body, your gut instinct, your heart) revealing to you about you in this moment? What most stands out to you from this short reflection? See if you can form it into a prayer starting with, "God, grant me the grace to....."